A CHILLING COLLECTION OF TELEVISION TERRORS IN THE TRADITION OF THE TWILIGHT ZONE AND ONE STEP BEYOND! 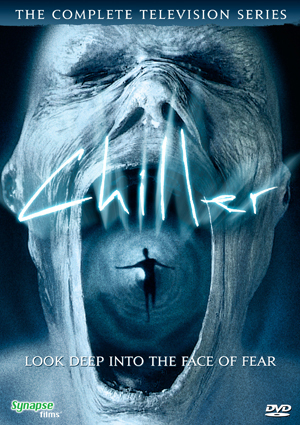 The television series Chiller was a five episode horror anthology that aired in the UK in 1995. Presented here for the first time in the U.S., these supernatural shockers feature malevolent spirits, a brutal serial killer and a haunted house set in contemporary England. Starring many of Britain’s leading actors like Nigel Havers (Chariots of Fire, TV’s Coronation Street), Martin Clunes (UK’s Men Behaving Badly), Sophie Ward (Young Sherlock Holmes) and Kevin McNally (Disney’s Pirates of the Caribbean series), this compelling collection will leave you chilled to the bone! When a group of friends hold a séance in the basement of a London café, they each receive a prophecy. Five years later, the frightening prophecies begin to come true. Ray and Louise Knight tragically lose Toby, their unborn baby, in a car accident. Louise soon discovers she’s pregnant again, but a routine scan reveals she is not… even though her body feels like she is! A social worker helps a young homeless man but may die trying, when she discovers her predecessor was murdered under mysterious circumstances. Richard Cramer, a professional de-bunker of the paranormal, moves into Windwhistle Hall with his family, only to find themselves involved in a series of unexplained events and accidents. In Helsby, a small Yorkshire town, police search desperately for a child killer. Tied somehow to an ancient Druidic site, this killer may strike again at the next full moon.